It's March, and that can only mean one thing: it's bracket making season! We assembled a bracket with some of the most popular Murphy by Enovation Controls products and seeded them at random. For the last few weeks we ran polls asking you to pick your favorite Murphy products and now the Champion has been determined! The PowerView 1200 is our champion! In a runaway victory, the PV1200 has claimed the top spot in our bracket and among our customers. The PV1200's ultra-wide 12.3-inch display has been a hit since it's introduction and its expansive storage and high-speed processor give it the ultimate ability to showcase graphics, transitions and videos. It takes resiliency to win a tournament, and the PV1200 was made for harsh outdoor environments. Its bonded LCD can easily be viewed, even in full sunlight, and its available glove-friendly touchscreen and rugged design make it a perfect solution for all types of environments and applications. Contact your Murphy by Enovation Controls sales representative to get started on your next PV1200 project. We picked three lucky winners from the pool of correct guesses! We'll be contacting you via email to send you your prizes. It all comes down to this. After a few rounds of close calls, the Swichgage loses by a single vote and the PV380 is defeated in a unanimous decision. The PowerView 1200 is ready to win. It's ultra-wide shape might seem unconventional, but the revolutionary technology inside has made it an instant favorite of engine and vehicle OEMs for a wide variety of applications. Its cutting edge touchscreen isn't just great to look at, it's also available with glove-friendly touch so work doesn't stop when the gloves stay on. After beating its 10.6-inch sibling in Round 1, the PV1200 has handily beat all other rivals. Heading into the Championship round, the PV1200 looks like the clear favorite. The PowerView 485 won't be going down without a fight. The smaller of the two displays, the PV485 has found its niche on smaller equipment and in places where a large display just won't work. While both displays are designed for use in harsh outdoor environments, the PV485 has five tactile-buttons that offer operators the comfort and convenience of a traditional button interface. The PV485 has not win a single game in this tournament by a large margin and could be looking for one last squaker to win it all. We're now down to our final four! 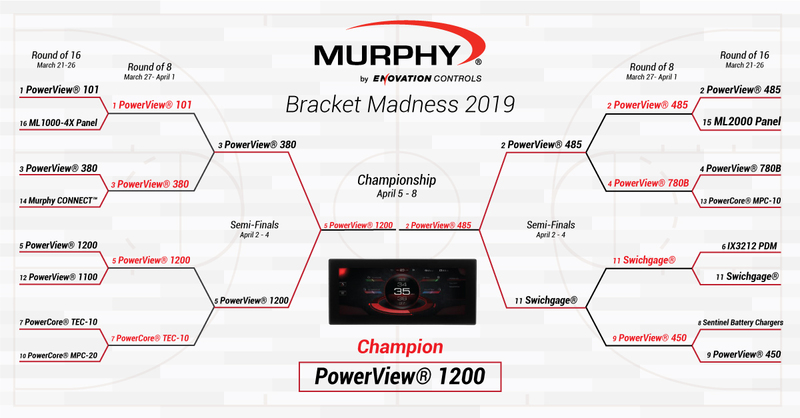 The PowerView family is well represented with the PV380, PV485 and PV1200 but the classic Murphy Swichgage made its way into the semifinals by a single point! In Game 1, the PowerView 380 is up against the PowerView 1200 to determine which display should make it to the championship. These two displays are about as different as they come, but our customers love them both for their superior sunlight viewability and their resiliency in harsh environments. It's gonna be a tough decision, but only one of them can win. Who will you choose? Vote below to to make your voice heard! In Game 2, the PowerView 485 takes on the legendary Murphy Swichgage. The Swichgage has consistently been the cinderella story of the tournament and enters the semifinals as the only non-display product. Customers love our display products, be we also hear stories of customers who use a single Swichgage for over 30 years. No matter which product wins, both are made to our same high standards and are backed with a solid warranty to keep your equipment running. Can the Swichgage go all the way in this tournament? Vote below to find out! The first round was brutal for PowerCore controllers and panels, and even the bracket-favorite PDM went down in a close matchup against the legendary Swichgage. But now that our thrilling opening round come has come to a close we now have some exciting new matchups for our Round of 8. In Game 1, the PowerView 101 is head-to-head with the PowerView 380. The classic PV101 has delivered cost-effective engine control to customers for over a decade, but the PV380 is ready to rumble! The PV380 provides a bigger screen with a significantly higher resolution to display more information clearly, features five tactile buttons and is easy to read in direct sunlight. Who will be the winner? Vote below to find out! In Game 2, the PowerView 485 takes on the PowerView 780B. This family-matchup could be very close as both displays bring their very best to our customers, but the PV780B brings some added punch with a high-speed processor that can seamlessly showcase graphics, animated transitions and video. Who's your choice? Vote below! In Game 3, the PowerView 1200 faces off against the PowerCore TEC-10. In the ultimate challenge of PowerView versus PowerCore, both product families have sent standout competitors. The PV1200 is as powerful as it is wide, and the TEC-10 is as gamechanging as it is cost-effective. This will be one to watch for sure! And in Game 4, the legendary Murphy Swichgage is up against the PowerView 450. A classic versus another classic, this right here is the Cinderella story of this tournament. A dynasty was forged in the Swichgage, and this tournament is going to test everything it has left. Will the Swichgage make it to the next round? Make your voice head in the poll below!